The second installment of the bestselling RPG set in the popular Star Wars universe. Contrary to its predecessor created by BioWare, it was developed by Obsidian Entertainment. 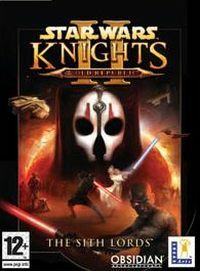 Star Wars: Knights of the Old Republic – The Sith Lords for PC and XBX is the second game in the brilliant series of RPGs by BioWare. However, it was developed by a different team, namely Obsidian Entertainment, a partner of the former. The action of The Sith Lords starts five years after the events of the original Knights of the Old Republic. Its story is not a direct continuation of its predecessor (which results in the inability to import your character). The players assume the role of the last knight of Jedi, a veteran of Mandalorian Wars who comes back to the Republic which was devastated by a war between Jedis of the dark and bright side of the Force. As a result, the Jedi Order was dissolved and the galaxy plunged into chaos. As you might guess, the protagonist has to restore the Order and the former orderliness. Due to the fact that our Jedi has been banished for a long time, at the beginning of the game, he practically has no major powers at his disposal; not even a lightsaber. Of course, as we progress, all forgotten skills are restored and expanded. The structure of the title is exactly the same as that of Star Wars: Knights of the Old Republic. What’s more, it uses the exactly same engine and technological solutions. The developers did not try to forcibly think of something new but instead used the tried and slightly enhanced mechanics to tell a completely new multi-threaded story with numerous plot twists and side quests. Similarly to the first installment of the series, the course of the story, individual events as well as the climax depend on the player’s decisions and behavior. Both the interface as well as the combat system remained practically the same. Some minor improvements were introduced, such as two weapon configurations that can be quickly switched between depending on the kind of enemy player faces. We can have a maximum of three characters in our party at the same time (the protagonist + two other teammates), although there more to chose from, just like in KotOR 1. In the game, we visit seven worlds, including Dantooine and Telos. We meet some old friends: Revan, T3-M4, and HK-47, among others. We can also play a number of well-known mini-games, such as Pazaak, and even pilot Ebon Hawk. One of the biggest novelties introduced in The Sith Lords for PC and XBX are the complex possibilities of modifying and crafting new items from various parts, even those received from disassembling stuff. It gives players the ability to customize equipment to individual traits of their character. There are also some new prestige character classes to choose from, these include the Sith Lord, Sith Marauder, and Sith Assassin for the dark side, and the Jedi Master, Jedi Watchman, and Jedi Weapon Master for the bright side. We can also make use of new Jedi powers like Dark Sider Rage, Battle Meditation, Force Sight (seeing through walls) and Force Clairvoyance (letting us see unvisited parts of a level).